FREE INTRODUCTORY LEVEL Expressive Language Activity! 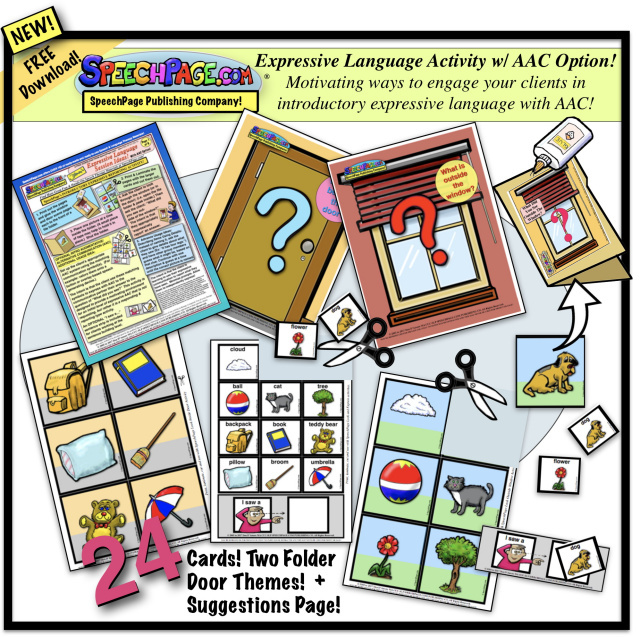 A NEW UPDATED FREE PRINTOUT activity for Introducing a Client to using EXPRESSIVE LANGUAGE with an AAC OPTION! A FREE DOWNLOAD of TWO FUN "Folder Opening" activities starting with one word level of reporting of what the client has just seen! "What do you see outside the window?" and "What do you see behind the door?" Plus matching picture communication symbols and suggestions for introductory SLP AAC usage! One page of therapy usage suggestions as well as TWO PAGES of Printout PICTURES of illustrations from SpeechPage.com Publishing Company to use with your own file folder to complete the FUN and Motivating activity. PLUS A PAGE OF MATCHING AAC PICTURE SYMBOLS FOR OPTIONAL AAC USAGE! ALL FREE! These are possible suggestions only, and all therapy goals are at the discretion of a qualified Speech Language Pathologist, based on the goals for the individual following multi-factored evaluation. Only the qualified SLP working with the individual can determine the best therapy methods to use. These materials were designed for use by a qualified professional familiar with Expressive Language therapy and AAC and this download is NOT designed for use by those unfamiliar with therapy of this nature. THESE ITEMS MAY BE SHARED WITH OTHER SLPs. This item is a large file size, so allow time for it to load on slower internet connections. Looking for FUN EXPRESSIVE MATERIALS at the SENTENCE LEVEL? SpeechPage.com Publishing Co. Also carries INTERACTIVE SENTENCE Building SpeechPages! AND INTERACTIVE SEQUENTIAL PICTURES/SENTENCE MAKING SpeechPages! These Super FUN Activity SpeechPages are motivating fro your clients working one Sentence Level Expressive Communication! NOTE: IF YOU ARE NOT AN SLP: Recommendations for appropriate Speech Language Therapy can only be made by a qualified Speech Language Pathologist (SLP) following a formal multi-factored Speech and Language evaluation. There are many different aspects of the individual's abilities and degrees of severity of speech pattern differences that must first be determined through formal evaluation by a qualified professional before therapy can begin. This item and all items from SpeechPage.com are not designed for usage by anyone but a qualified professional.